Happy FIRST Birthday Prince George Alexander Louis! A Look Back on His First Year! Birthday cake will be eaten at Kensington Palace today in celebration of baby Prince George’s first birthday! 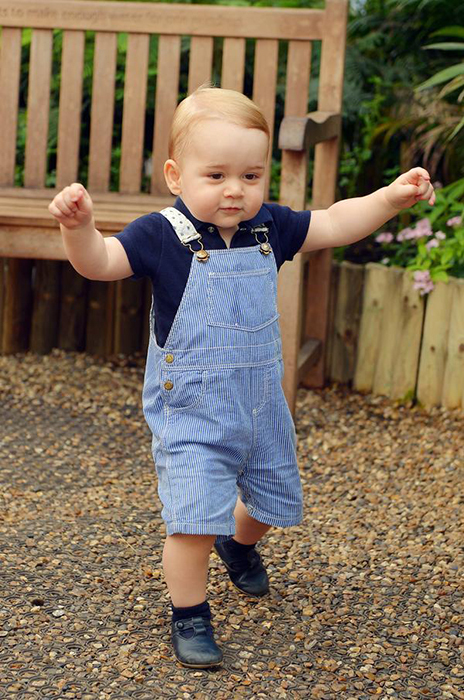 And, he’s already walking…and apparently “charging around” Apartment 1A…according to his daddy Prince William. 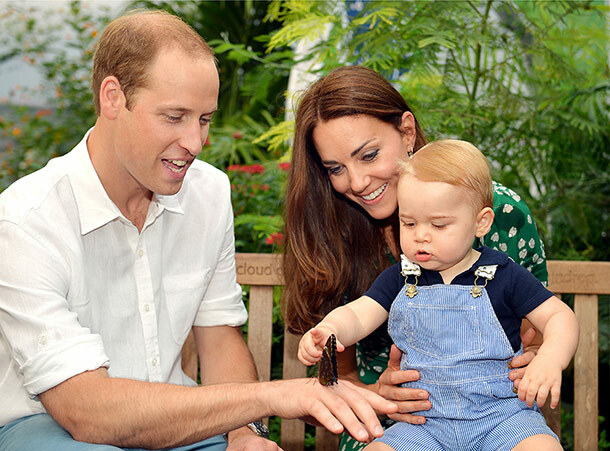 Let’s take a look at Prince George’s amazing first year…. 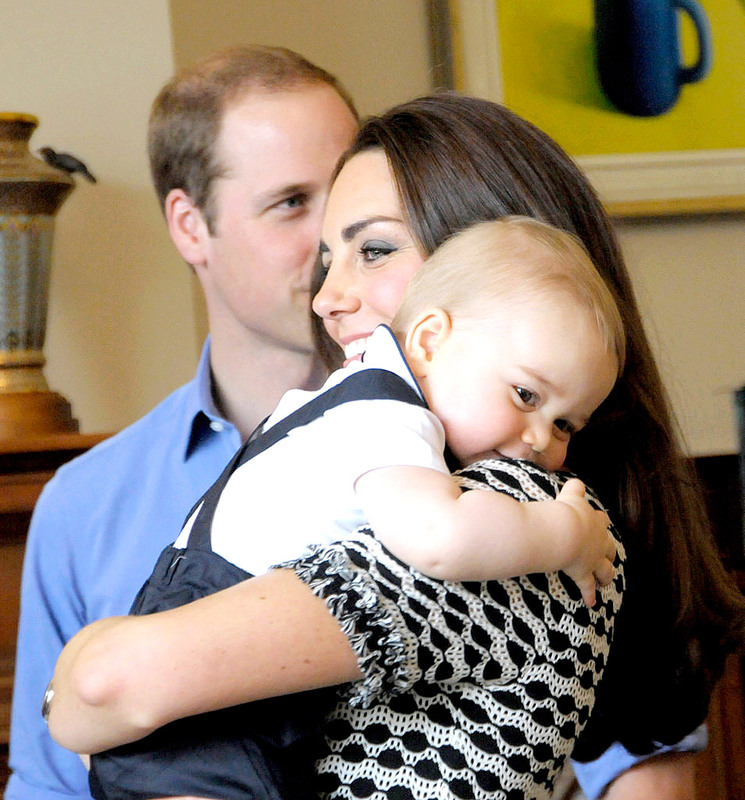 Charging about the palace….Baby George is ONE today! Prince George Alexander Louis was born at 4.24pm on 22nd July 2013 at St Mary’s Hospital in Paddington, London. 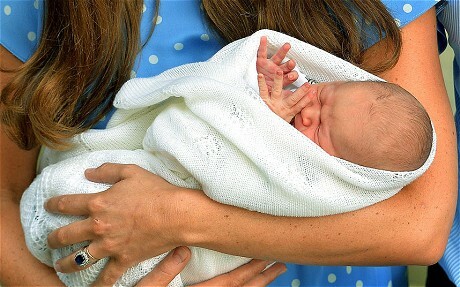 The first child of William and Catherine, The Duke and Duchess of Cambridge, Baby George is third in line to the throne. One can hardly believe a whole year has gone by since the world’s media pitched their tents and camped out for days in front of the Lindo Wing of St. Mary’s waiting Prince George to be born. And when he finally emerged from the hospital, swaddled in his baby blanket, in his mummy’s arms…the whole world rejoiced! First glimpse of Baby Prince George and a cheer heard around the world! 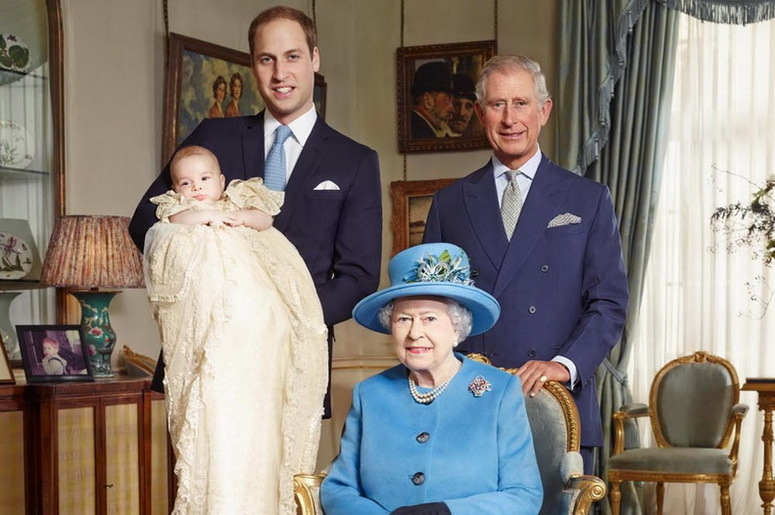 Swaddled in his baby blanket, Prince George seems to be waving to the world. 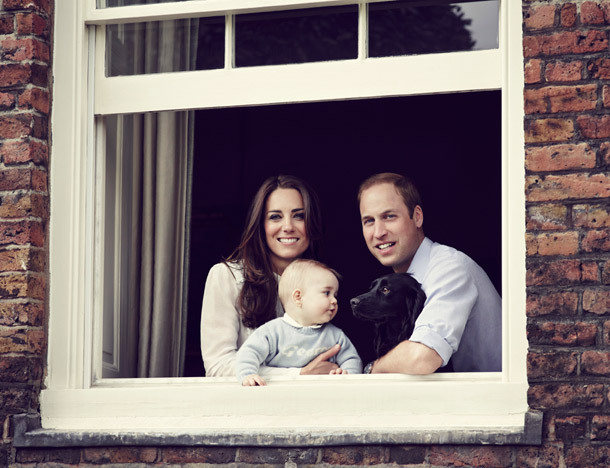 The next glimpse we got of him was this lovely family photo taken by Grandpa Middleton himself, in the garden of the Middleton family home in Bucklebury, Berkshire, with their dog, Lupo. 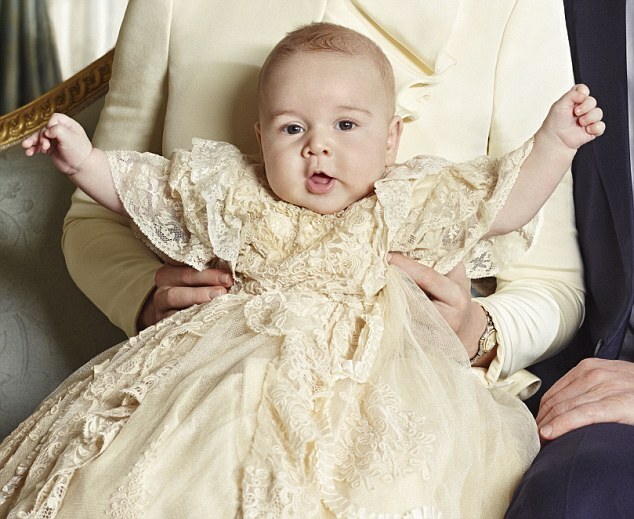 In keeping with Royal tradition, Prince George wore the hand-made replica of the Royal Christening Robe originally made for Queen Victoria‘s eldest daughter Victoria, The Princess Royal in 1841. 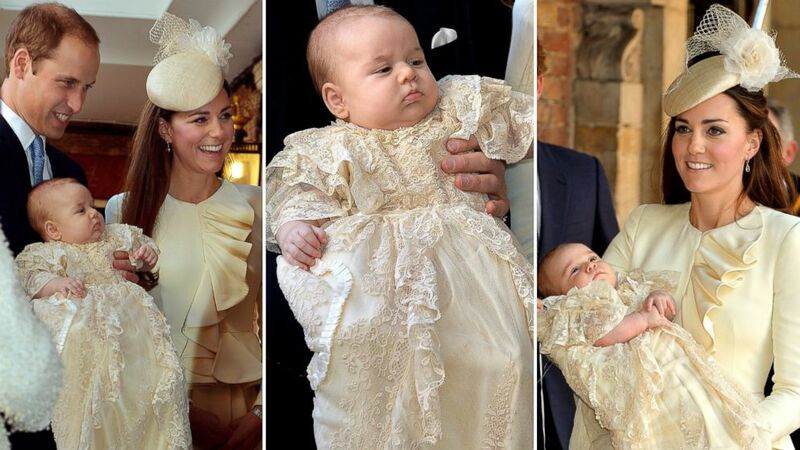 George’s gown of delicate Honiton lace and ivory satin was made by Angela Kelly, Dressmaker to The Queen. The Lily Font and water from the River Jordan were also used during the baptism. He was such a jolly baby at his Christening. Historic photo! Current and Future Monarchs! The private service was attended by close family. The guests were The Queen and The Duke of Edinburgh, The Prince of Wales, The Duchess of Cornwall and Prince Harry, Mr and Mrs Michael Middleton, Mr James Middleton and Miss Pippa Middleton, along with Prince George’s Godparents and their spouses. Following the service, a private tea was held at Clarence House. Guests were served slices of christening cake, which was a tier taken from The Duke and Duchess of Cambridge’s wedding cake. I think that’s a lovely tradition! 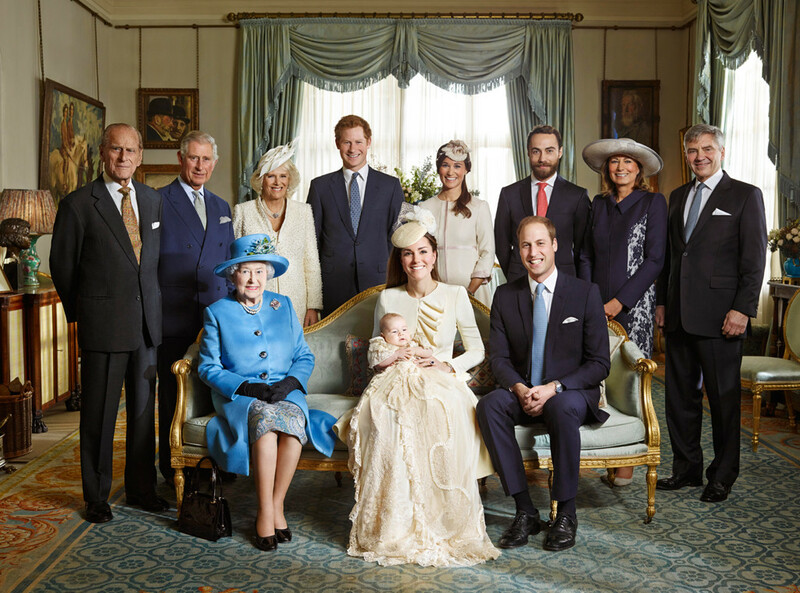 After the christening, the family gathered at Clarence House for tea. To be sure Prince George gave us a year filled with wonderful photo ops and lovely memories especially on his first overseas trip! 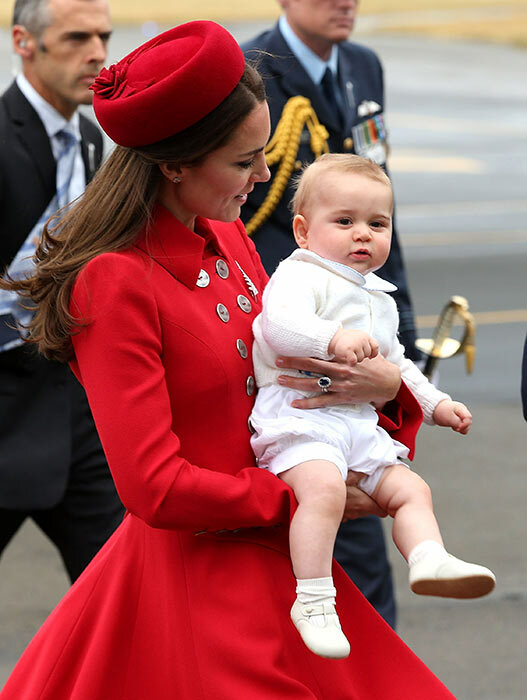 In April 2014, Prince George accompanied his parents on their official three week tour of New Zealand and Australia, and received a warm welcome in both countries. 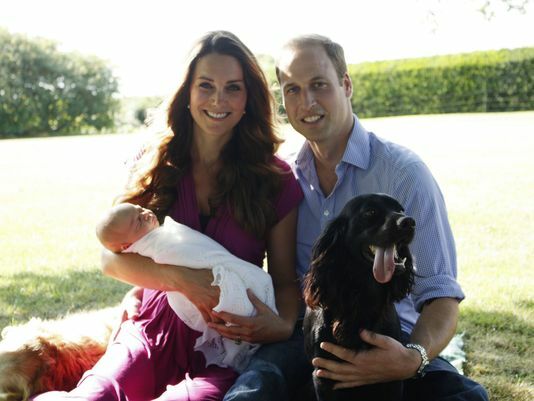 Family photo released ahead of the Royal Tour to New Zealand and Australia. Here are some of our favorites featuring those trademark chubby cheeks photographers around the world have fallen in love with! Arriving New Zealand where he was about to steal everyone’s hearts! 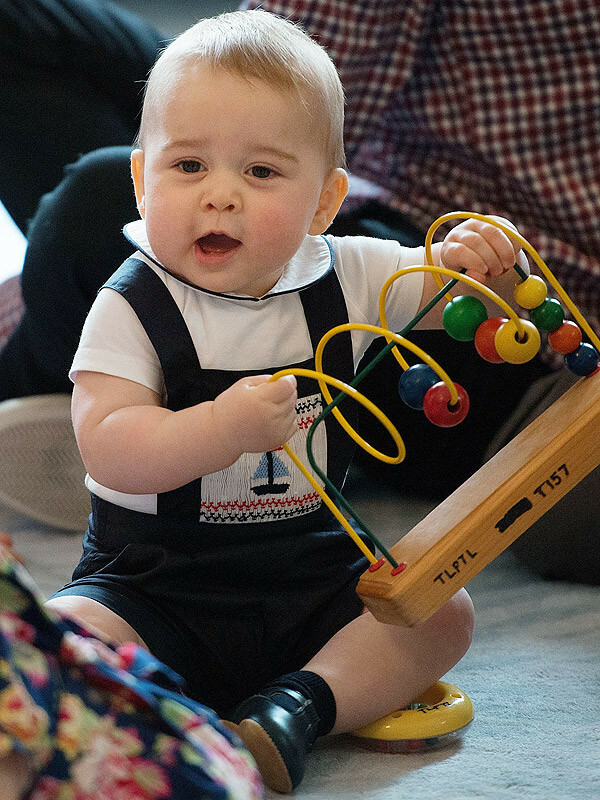 In New Zealand, Prince George enjoyed a play date with other babies the same age at Government House in Wellington when the Royal New Zealand Plunket Society arranged a special family gathering. Lucky little girl that gets to play with Prince George! 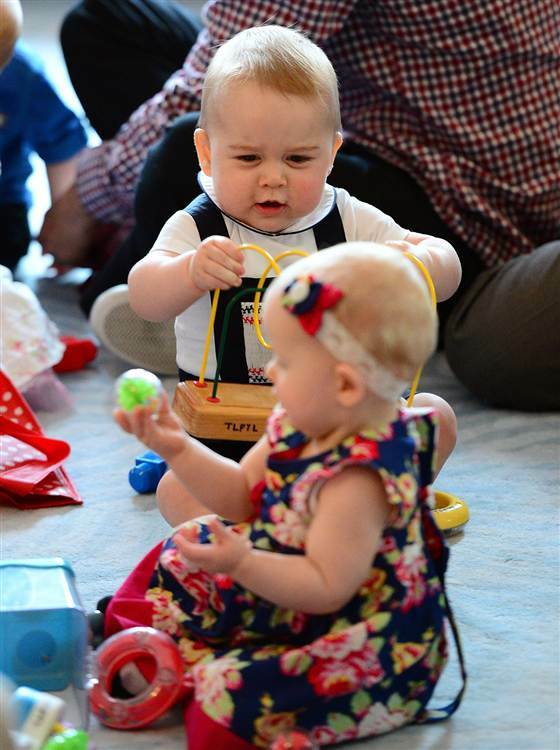 Prince George shares his toys at royal playdate. In Australia, Prince George enjoyed an Easter Sunday trip to Taronga Zoo in Sydney, where he met a Bilby named George. 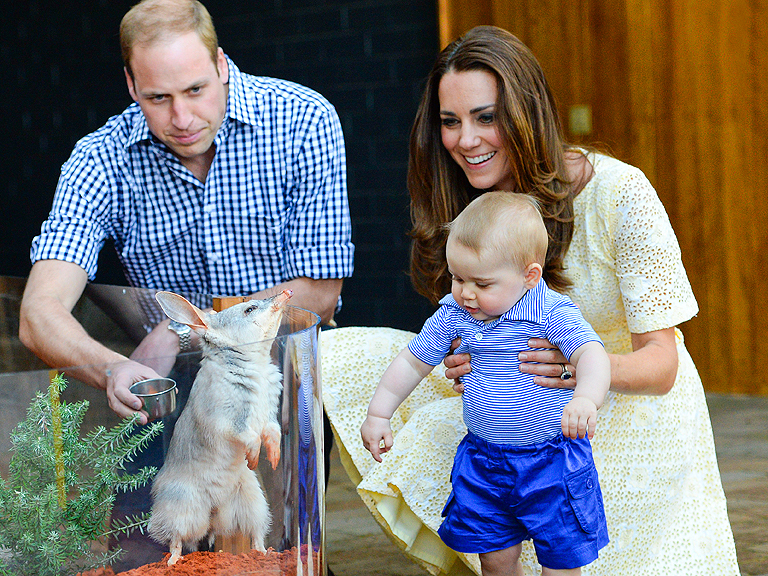 Taronga Zoo had named the Bilby enclosure in honor of Prince George’s birth, as part of a conservation program. 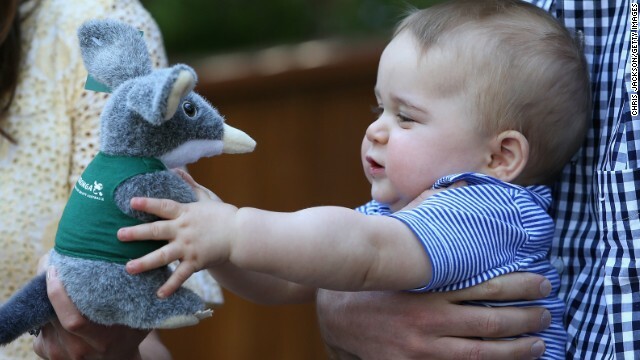 Baby George gets a toy bilby at the zoo. “All better Mummy” Baby George fixing his mummy’s hair. I absolutely adore this photo! It was a big trip for such a young child but he handled it all with adorable grace. Catherine is said to have been ‘relieved’ that he behaved so well in public as he is a bit of a live wire behind the scenes. 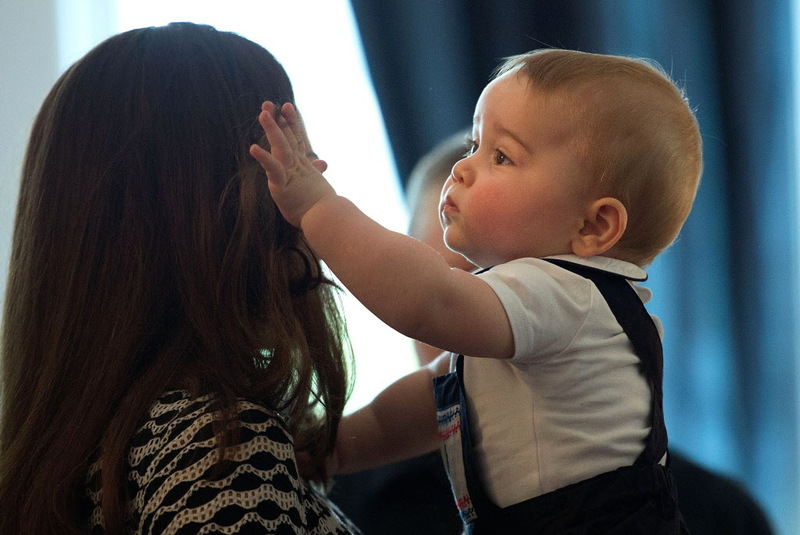 And we’d expect nothing less of this future monarch! Another favorite…cuddled up to his mummy. 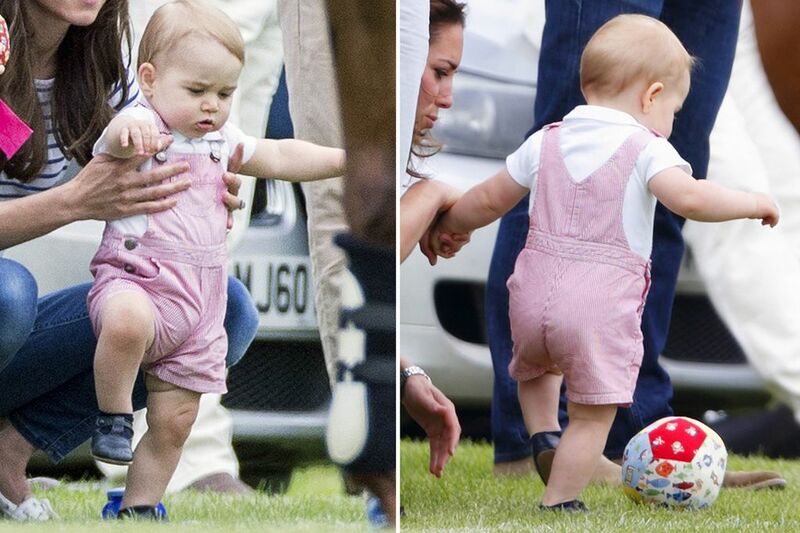 On Prince Willliam’s first Father’s Day, Baby George and The Duchess of Cambridge went to cheer on his daddy at a charity polo match…and showed the world his emerging walking skills! Showing off his walking skills and perhaps a future football enthusiast? 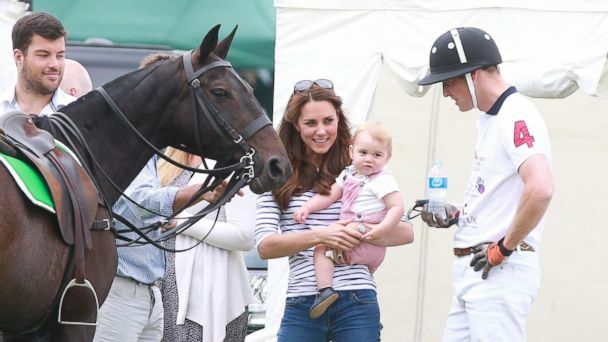 A Happy First Father’s Day for Prince William at this charity polo match watched by his son. 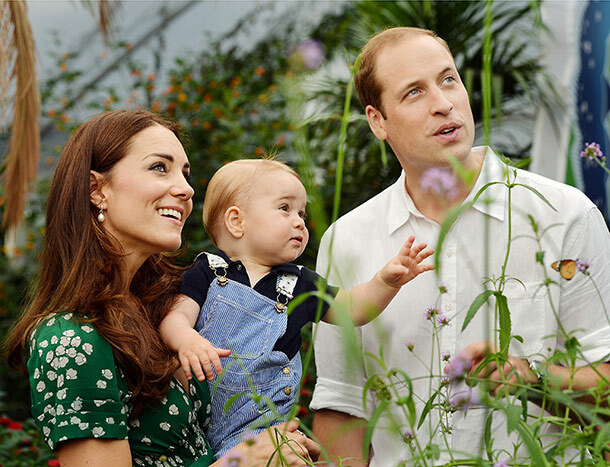 Baby George is said to have a fascination with nature. Can this family be any more beautiful? The future of the monarchy in this lovely photo. A small Peter Rabbit themed birthday party was said to have been thrown at Grandma and Grandpa Middleton’s home. Another private party will be held at Kensington Palace where The Queen is expected to be in attendance. Can you imagine the Peter Rabbit party that Grandma Middleton can pull together? Happy First Birthday Prince George! And we wish them all the joy and love in the world and here’s wishing darling Prince George many happy returns! 1 Response to Happy FIRST Birthday Prince George Alexander Louis! A Look Back on His First Year!